Ever since I started making hand-making my Christmas cards, I’ve had this idea that one year I would make cards with beautiful, lacy, crocheted snowflakes on them. I tried a couple of times but, as a fairly inexperienced crocheter, I really struggled to follow the patterns that I found and it was clear that I just didn’t have the skills yet to do justice to the vision in my head so I abandoned the idea and did something different instead. Then, in September, I saw Lisa of Polka Dot Cottage‘s review of 100 Snowflakes to crochet and her snowflakes were exactly what I’d always pictured. 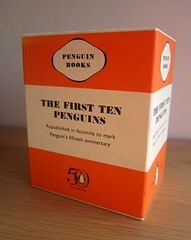 A quick visit to Amazon later and a copy was winging its way to me. As book titles go, this isn’t the most original but it does deliver exactly what it promises: 100 patterns for crocheted snowflakes. The patterns are graded from beginner to advanced and there’s a showcase at the start to make it easy to pick the snowflake that you want to make. 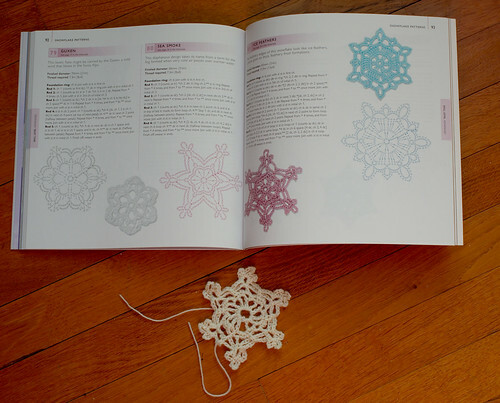 The book includes information on materials and tools, and a crochet refresher course that covers all the stitches and techniques that you’ll need to make any of the snowflakes in the book. There is also a section on the structure of snowflakes to help you create your own patterns if the 100 in the book aren’t enough! One of my regular complaints about this type of book is that inappropriate (fuzzy) yarns are used or the pictures aren’t clear enough for you to see all the details but not here. All the photographs are beautifully clear allowing you to see the individual details of each pattern. 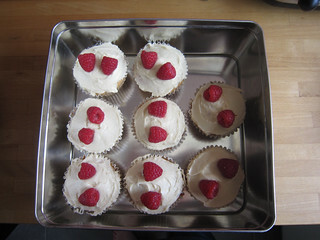 The patterns themselves are also easy to follow. The snowflake in the picture above was completed on only my second or third attempt and it’s one of the advanced patterns (No. 80, Sea Smoke). Every pattern is also charted. I haven’t managed to get my head around crochet charts yet despite my love of knitting charts but I do like that they’ve been included. The snowflake above was made with 4 ply yarn and (I think) a 3.75mm hook but was far too big for putting on a card. Instead, I tried with some actual crochet thread but it was just too fine and fiddly for my inexperienced fingers. Then I tried again with some laceweight yarn and a 1.75mm hook. These snowflakes were made using Fyberspates Truly Scrumptious lace and were the perfect size for attaching to the front of a card. The snowflake on the left is unblocked and the one on the right had been sprayed with water and then lightly ironed through a towel. Although I had crocheted the snowflakes well in advance of when I needed to post my cards, I got sick and, by the time I was better, didn’t have time to soak and block them with pins. 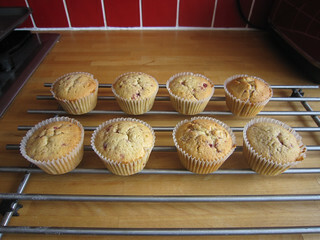 This is also why I don’t have any pictures of the completed cards! 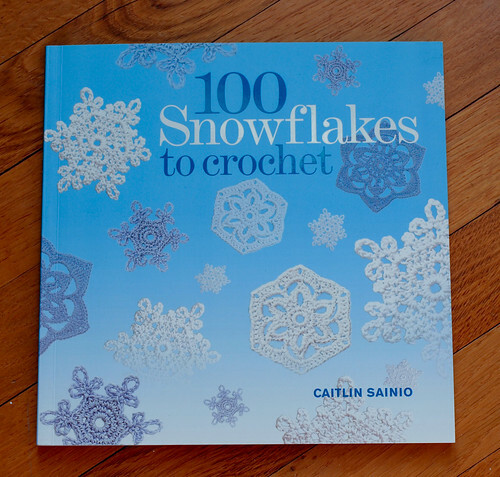 To sum up, if you have any interest whatsoever in crocheting snowflakes then this is the book for you. As a craft book, it does have a very specific focus but it does exactly what it sets out to do and does it well. 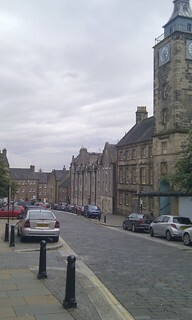 I spotted both a yarn shop and a fabric shop in Stirling but they were closed when we were there on Sunday so I didn’t get to look around. However, I did find a whole selection of cheap knitting and sewing books in one of the discount bookshops in the city centre. 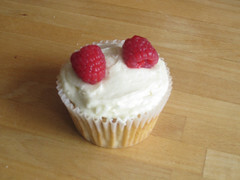 I managed to restrain myself and only bought two. First was Fitted Knits by Stephanie Japel. I bought this mainly for inspiration and the section with hints and tips on customising patterns since few of the patterns would actually suit me, particularly in the heavier yarns that most of the patterns call for. 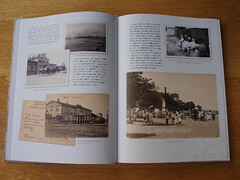 It’s a beautiful book though and easily worth the £3.99 that I paid just for the photography! 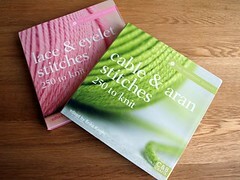 I’m hoping to get more use out of the second book which was Sew U Home Stretch by Wendy Mullin. 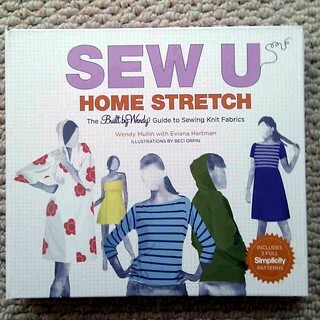 I’ve heard really good things about the Sew U books and I’ve been wanting to have a go at sewing knit fabrics for a while since I’d love to be able to sew my t-shirts and tops for work. The patterns included with the book don’t go big enough for my bust size but there is plenty of discussion about how to apply the principles in the book to ordinary commercial patterns. 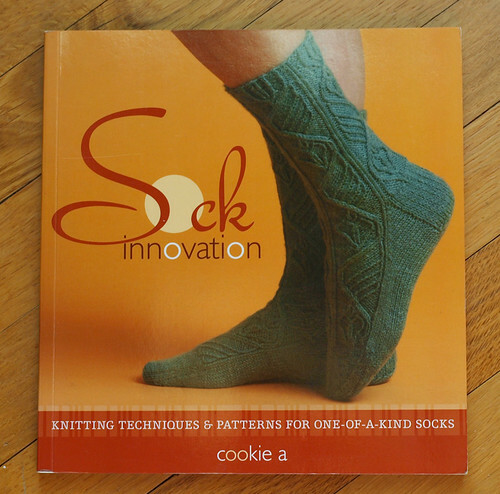 There is even a section on making your own patterns from existing items that you love. 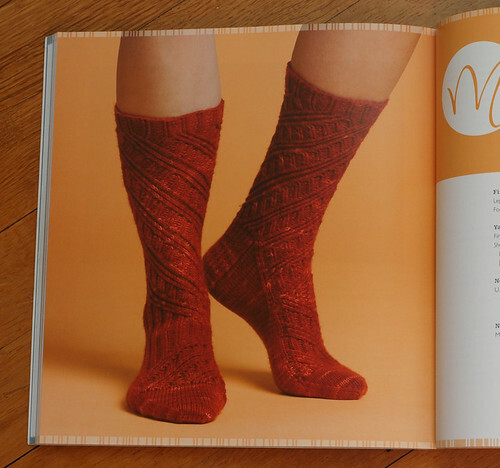 If we weren’t moving I would love to have taken the class on sewing knits that The Make Lounge are introducing but the first class isn’t until October so I’ll just have to make do with the book and the internet for now. I’ll let you know how it goes! 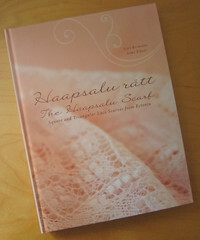 Given how much I loved the Haapsalu Shawl book, the only real question when the follow-up was announced was how long I would be able to resist buying it. The answer: not very long at all. Other than the joy of owning something beautiful, the real value for me comes again in the form of the hundreds of beautiful stitch patterns that are included. There is very little (or possibly no) overlap between the patterns in the two books so there’s no reason not to own both! …of knitting gifts for my mother-in-law and then keeping them for myself. She doesn’t know that I do this but it doesn’t stop me feeling guilty about it. I decided though that last year would be different and that I would get around the problem of not being able to part with whatever it was by knitting two very similar items and then picking one to keep and one to give to her. I’ve had this Hedgehog fibres silk lace yarn for ages and decided it would be perfect for two lacy scarves. We both wear a lot of warm browns so the colours were ideal as well. 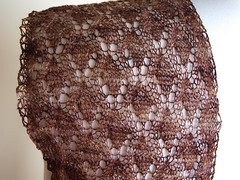 I picked a couple of lace patterns from the Haapsalu shawl book, swatched, blocked my swatch and then started knitting. Presumably because they were intended to be knitted for sale, the Estonian stitch patterns are easy to memorise and seem to just flow off the needles. For all that these look complicated, they were actually good TV knitting. The end result was two lovely, floaty, lacy scarves. 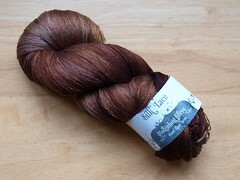 I loved the Hedgehog Fibres silk – the colours are beautiful and the 100% silk is really luxurious. Not only that but the yardage was incredibly good so I still have half a skein left! 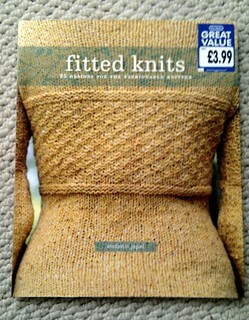 I’m going to come straight out and say it: this is my favourite knitting book, ever. Not only does it have beautiful photography and styling that you would expect to see in a coffee table book, it also has wonderfully clear knitting instructions and charts for knitting your own versions of these beautiful shawls. 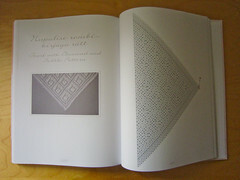 The book is split into three sections: the history of the Haapsalu shawl, “Teaching the Traditions”, and the stitch patterns. 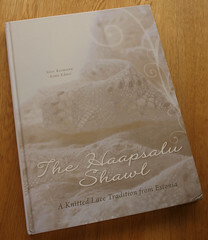 The history section covers the beginnings of shawl knitting in Haapsalu (a small town in Estonia), for sale to wealthy Russian holidaymakers, and then how the tradition continued through two World Wars and Communism up to the present day. “Teaching the Traditions” tells you everything you need to know about how to knit your own shawl describing yarns, needles, calculating stitch counts for casting on, reading charts, and how to knit and attach the lace edging (which, traditionally, is sewn on rather than knitted on). Then there are the stitch patterns and, if you didn’t look at any of the other information in the book, it would still be worth buying the books just for these. 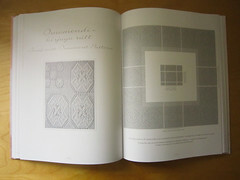 There are more than 100 separate stitch patterns given and each one gets its own page with a crystal clear photograph of a swatch and its chart. There are 9 lace edgings included too, also with photographs and charts. There are no written instructions for the patterns so you do have to be comfortable reading charts. The charts use slightly different symbols to those that I’m used to seeing (and using) in patterns but a full key is given and I haven’t had any problems following them. The patterns themselves are beautiful and frequently complex. Some include nupps (little bobbles) and manipulated stitches but some involve nothing more complicated than yarn-overs, k2tog and ssk. 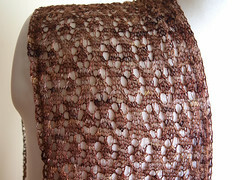 It would take a certain amount of courage to cast on for one of these shawls without having knitted any lace previously but if you’ve got a couple of shawls under your belt, you will find plenty to inspire and challenge you here! While I’m back in the blogging habit, I’m going to try and catch up on reviewing my library of craft books, which has been expanding rapidly! 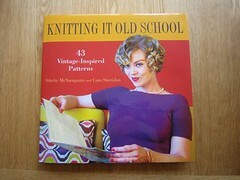 My most recent purchase was Knitting It Old School by Stitchy McYarnpants and Caro Sheridan. 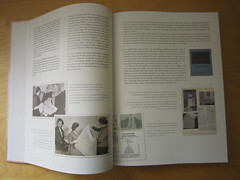 The book contains 43 patterns inspired by fashion from the 1940s through to the 1970s. Although the majority of the patterns are knitting patterns, there are several crochet patterns as well. The patterns include jumpers, skirts, dresses, hats, socks, toys and accessories with some of the jumpers having matching gents’ and ladies’ versions. The fun, colourful photography and graphic design of the book make it a great book to just pick up and flick through even if you’re not knitting from it. 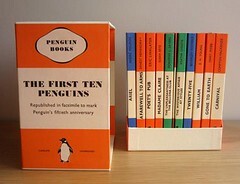 The writing (and many of the patterns) reflect the authors’ quirky senses of humour. I end up smiling and giggling every time I look through it. The “He’s not an Extra” pattern is a great example of the humour. 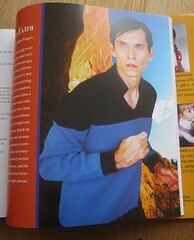 I offered to knit this for Steven but he didn’t seem terribly keen on the idea. I will be knitting the ladies’ version for me, but in a short-sleeved, single colour version since I love the v-neck, stand-up collar tunic style. And just to show that there are some great patterns that don’t require an unhealthy love of Star Trek or a quirky sense of humour to enjoy here is “Pump Jockey“, which Steven was somewhat more keen for me to knit. 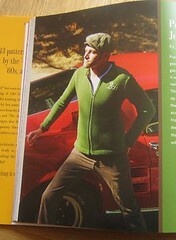 You can see the rest of the patterns on the book’s Ravelry page. The number and range of sizes varies from pattern to pattern but the ladies’ patterns seem to start at about 32-34″ chest size and go up to about 48-50″, the gents’ from about 38-40″ up to about 50-54″. I highly recommend this book. Given how much I enjoy flicking through it and the fact that I’m already lining up three or four of the patterns to knit, it’s already one of my favourites. I bought these books a little while ago but having been putting off reviewing them and this week I realised why — I just don’t like them. I’ve been waiting for them to magically improve so that I can say nice things about them and it is now time to accept that this isn’t going to happen. My first and biggest complaint is that there doesn’t appear to have been any sort of logic applied to the arrangement of stitch patterns within the books. 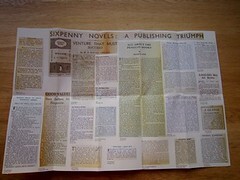 Some sort of logical arrangement might have helped the editor spot the patterns that are repeated under different names. Not just similar patterns with a slight offset or a slightly different description of the stitches — the exact same pattern with exactly the same wording (and photograph!) just different names. Similarly, there’s no way to find patterns by number of stitches or number of rows. This might not be such an issue with the cable and aran stitches but it makes the lace book very difficult to use other than to flick through for general inspiration. The photographs are another issue or rather the swatches are. I know how hard it can be to take a good photograph of a swatch but some of the yarn choices and particularly colours of the swatches make it impossible to appreciate the patterns. I’ve knitted a swatch for at least one pattern so far just to try and see what it looked like which defeats the purpose of them including photographs in the first place. 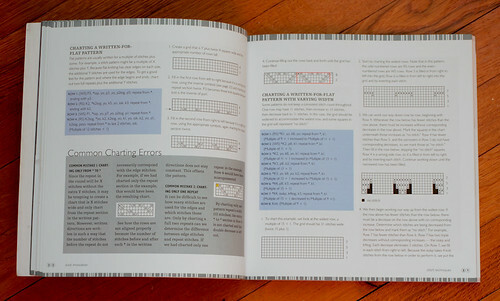 The lace book also has no charts, despite one of the ‘useful’ hints scattered throughout being “Take the time to learn how to read knitting charts; it’ll make your knitting that much easier”. To end on a somewhat positive note, I will admit that there are stitch patterns in the books that aren’t in any of the other books I own, I have used some of the stitch patterns and I’ve yet to find any errors in the patterns themselves. Not exactly a glowing recommendation but I’m afraid it’s the best I can do.